The atria may become dilated and/or hypertrophic during pathological circumstances. As for ventricular enlargement, the ECG cannot differentiate dilatation from hypertrophy, which is why some experts have suggested that the term atrial abnormality be used instead of enlargement. Atrial enlargement/abnormality often accompanies ventricular enlargement. The ECG has, as one could expect, low sensitivity but high sensitivity with respect to detecting atrial enlargement. Left atrial enlargement is also referred to as P mitrale, and right atrial enlargement is often referred to as P pulmonale. The reasons for this is explained below. The normal P-wave (Figure 1, upper panel) is typically smooth, symmetric and positive. The P-wave in lead II may, however, be slightly asymmetric by having two humps. This is often (but not always) seen on ordinary ECG tracings and it is explained by the fact that the atria are depolarized sequentially, with the right atrium being depolarized before the left atrium. The first half of the P-wave is therefore a reflection of right atrial activation and the second half is a reflection of left atrial activation. This is shown in Figure 1 (upper panel). Moreover, the P-wave may be slightly biphasic (diphasic) in lead V1, implying that the terminal part of the P-wave is negative (Figure 1, upper panel). This negative deflection is generally <1 mm deep. The amplitude of the normal P-wave does not exceed 2.5 mm in any limb lead. The negative deflection of biphasic (diphasic) P-waves is generally <1 mm deep. P-wave amplitude in limb leads <2,5 mm. If an atria becomes enlarged (typically as a compensatory mechanism) its contribution to the P-wave will be enhanced. Enlargement of the left and right atria causes typical P-wave changes in lead II and lead V1 (Figure 1, second and third panel). Enlargement of the right atrium is commonly a consequence of increased resistance to empty blood into the right ventricle. This may be due to pulmonary valve stenosis, increased pulmonary artery pressure etc. The right atrium must then enlarge (hypertrophy) in order to manage to pump blood into the right ventricle. 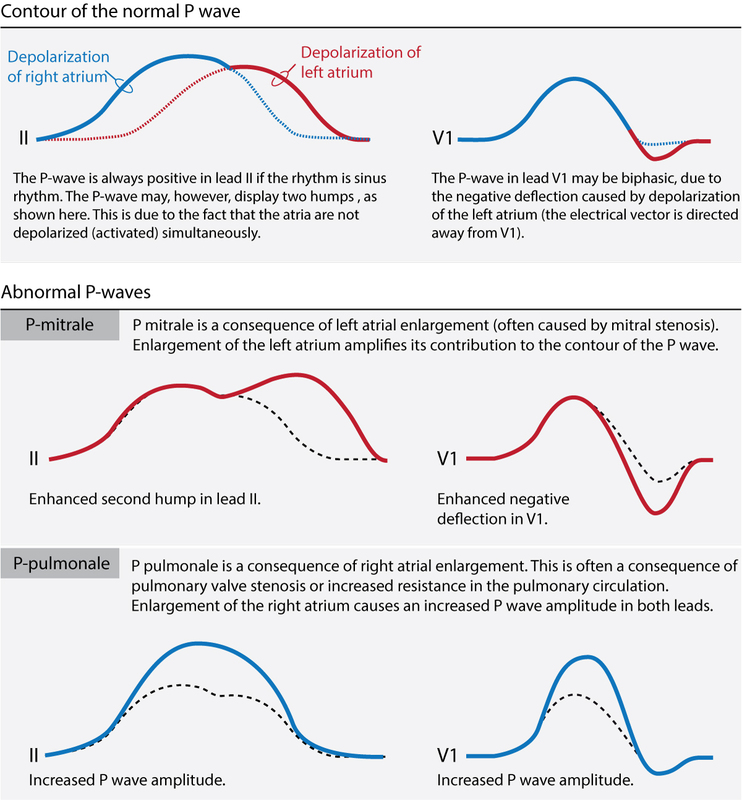 Right atrial enlargement (hypertrophy) leads to stronger electrical currents and thus enhancement of the contribution of the right atrium to the P-wave. The P-wave will display higher amplitude in lead II and lead V1. Such a P-wave is called P pulmonale because pulmonary disease is the most common cause (Figure 1). The P-wave amplitude is >2.5 mm in P pulmonale. If the left atrium encounters increased resistance (due to mitral valve stenosis, mitral valve regurgitation, hypertension, hypertrophic cardiomyopathy) it becomes enlarged (hypertrophy) which enhances its contribution to the P-wave. The second hump in lead II becomes larger and the negative deflection in V1 becomes deeper. This is called P mitrale, because mitral valve disease is a common cause (Figure 1). The duration of the P-wave will exceed 120 milliseconds in lead II. Biatrial abnormality implies that the ECG indicates both left and right atrial enlargement; i.e a large P-wave in lead II and a large biphasic P-wave in lead V1.